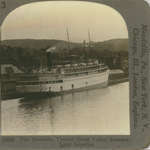 Black and white photograph of a crowd standing alongside a wharf, probably in the Thousand Islands, with the Canada Steamship Lines steamboat KINGSTON, lying alongside. A low terminal building is on the right of the image. 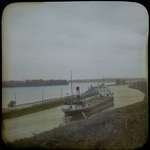 Green&apos;s Marine Directory of the Great Lakes, 1920 (Cleveland, OH 1920 ) "SAULT STE. MARIE, MICH. A Bird's-eye view of the four Locks."